Patients who have suffered for years with back pain may find relief through the improved accuracy of surgery with the Mazor Robotics Renaissance® Guidance System at ETMC Tyler. 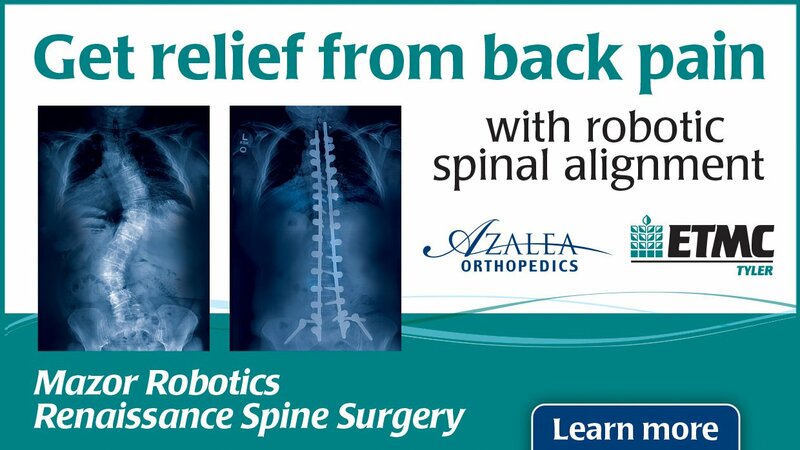 Two surgeons with Azalea Orthopedics perform the surgery: Michael Merrick, MD, and Todd Raabe, MD. “We can do it more accurately and we can do it faster with the Mazor system,” Dr. Merrick said. “It’s more than 99 percent accurate, versus doing it freehand, which is maybe 85 to 90 percent.” “It has been incredibly precise and more reliable than any other image-guided system I’ve ever used. It makes me better and more accurate,” Dr. Raabe said. The Mazor Robotics system has improved the accuracy of spinal surgery. Before each operation, the Mazor system’s software converts a CT scan of the patient into a 3-D image of the patient’s spine. This gives the surgeon an individualized plan to bring the spine into alignment. The system guides the surgeon’s placement of each pin and rod. Mazor Robotics Renaissance Spine Surgery is available in East Texas only at ETMC. For more information, please call 903-747-4110.